Graphic from Jane Place Neighborhood Sustainability Initiative report on evictions in New Orleans. A new report by the Jane Place Neighborhood Sustainability Initiative found that 5.2 percent of New Orleans renter households were subjected to court-mandated evictions in recent years. That’s nearly twice the national average — 2.8 percent. The report was a collaboration between Jane Place and Davida Finger, a professor at Loyola University New Orleans College of Law. It’s based on court records from eviction cases in the First and Second City Courts from 2015 to mid-2018. 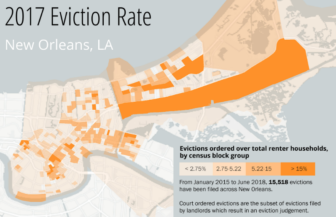 While the overall reported rate of evictions in New Orleans was high, the analysis also found that evictions were concentrated in certain neighborhoods. Specifically, they were densely located in low-income, majority black areas of the city. In block groups that were 90 percent or more black, the report found that one out of four renter households experienced a court ordered eviction. Block groups are a unit of measurement used by the U.S. Census Bureau and contain between 600 and 3,000 people. These predominantly black areas of the city only make up 29 percent of Orleans Parish’s 497 total block groups, but they contained the majority of the city’s court-ordered evictions, the report said. Conversely, it found that block groups that were less than 25 percent black only faced one court ordered eviction for every 24 renter households. The report also looked back in time, comparing “redlined” neighborhoods from the 1930s with current eviction rates. The term “red-lining” comes from a government sponsored program from the 1930s that categorized neighborhoods based on their perceived level of safety for real estate investments. Majority black neighborhoods were systematically given the lowest rating of “hazardous.” On maps, those areas would be shaded in red. The Jane Place report found that there was a correlation between New Orleans neighborhoods that were subject to redlining and those that now face high eviction rates. There were some neighborhoods that faced redlining that do not deal with the same eviction issues today, such as Bywater, the Irish Channel, and the Lower Garden District. But the report asserts that this is because of rapid gentrification and resident displacement in those areas. According to Finger, these numbers only represent a portion of the overall picture of eviction rates because the report was based on court mandated evictions. Jane Place Program Manager Breonne DeDecker said that the high rate of evictions is inextricably linked with the city’s overall affordable housing crisis. She said that residents who are paying more than 30 percent or even 50 percent of their income in rent are in a precarious position when it comes to the risk of eviction. The report concludes with a list of recommendations at both the state and local level that could alleviate the problem. On the local level, one of the recommendations focuses on the City Council’s current drive to overhaul the city’s short-term rental regulations. Jane Place has been a leading critic of the proliferation of short-term rentals in New Orleans and the regulatory structure that passed under former Mayor Mitch Landrieu’s administration. Tuesday’s report suggests that for every commercial short term rental permit in a building, that building would have to provide two units of affordable housing. Or, the report suggests, the building should provide one unit of affordable housing as long as the city imposed a percentage cap on how many of the building’s units could be used as short term rentals. The report urged another policy currently being mulled over by the council — mandatory inclusionary zoning. That could force new market-rate and luxury housing development to include a certain number of affordable housing units. On the state level, Dedecker and Finger specifically pointed to Senate Bill 28 of the 2019 regular session. The bill would give renters a longer grace period for missing rent and force landlords to give notice of eviction or termination of lease at an earlier date. This story was produced in partnership with WWNO-FM.